Hailey Dawson throws out first pitch with Robotic Hand - image from video below. 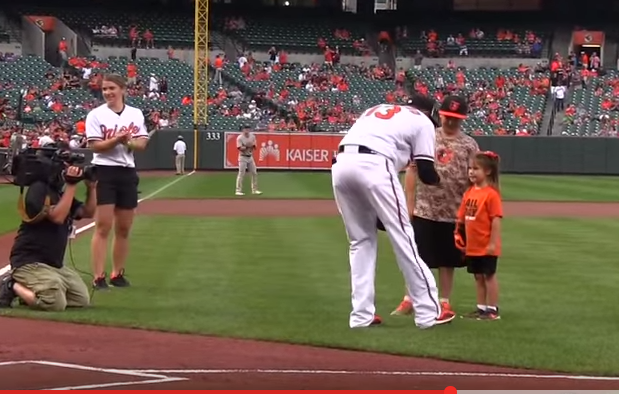 With a robotic right hand, 5 year-old Hailey Dawson inspired many by throwing out the first pitch at the Baltimore Orioles game. She was born with Poland Syndrome which left her without the fingers on her right hand. The robotic right hand was made by students at the University of Nevada at Las Vegas(UNLV). The robotic hand fits around her palm. Her fingers move with the movements of her wrist. Orioles 3rd baseman, Manny Machado caught her pitch and gave her a hug after she threw a pretty nice pitch to him. Please Share this Story with one of the Buttons Below. Thank you.